To be honest, when I first received a copy of The Search for God and Guinness I was not all that excited about it. I love God and I like beer, but I am not a big reader of biographies, preferring “more practical” books on leadership, spiritual issues, or social media. So, it sat on my bookshelf for several months. When in finally cracked it open I was sorry I waited so long to read it. 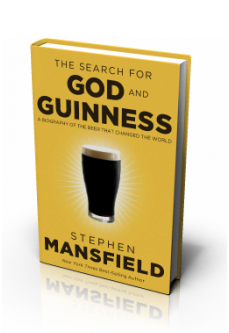 In the Search for God and Guinness, Stephen Mansfield tells the story of the Guinness family starting with Arthur Guinness, founder of the famed brewery, and continuing through the Guinnesses of today. While the book recounts the amazing rise of one of the must successful breweries in the world, what makes the book and the Guinness family fascinating is the accounts of their character, faith, and generosity. Because of their commitment to excellence and innovation in brewing the Guinnesses became exceptionally wealthy and influential. But rather than selfishly squander it on themselves, they were exceptionally generous with the pay and benefits they gave their workers and they demonstrated an unusual commitment to improving the conditions of the poor in Ireland and Great Britain. Clearly, this was the understanding at the time: gin destroys lives while beer is healthy and safe, enhancing rather than eroding good society. Arthur Guinness was the founder of the first Sunday schools in Ireland. October 25, 1886, the stock offering sold out within an hour. A Guinness worker during the 1920s enjoyed full medical and dental care, massage services, reading rooms, subsidized meals, a company- funded pension, subsidies for funeral expenses, educational benefits, sports facilities, free concerts, lectures, and entertainment, and a guaranteed two pints of Guinness beer a day. In 2005 the British people voted the widget (the small plastic capsule that allows a can of Guinness to be properly nitrogenated) the greatest invention in the previous forty years. A company should be measured by the culture it creates… what is encouraged to grow, the behavior and ways of thinking that are inspired. Guinness demonstrated the good that righteous wealth can do. A man’s profession was where he demonstrated to the world who he was. Don’t just sell your product – sell your product’s culture. Whatever else you do, do at least one thing very well. Stephen Mansfield concludes the narrative portion of The Search for God and Guinness with this line. That part of the heritage will only live when men absorb it from the Guinness story and embed it in fertile fields of their own. Clearly, he wrote this book not just to tell a fascinating story but to inspire leaders today to follow in the Guinness tradition. These two sentences sum up that tradition. What distinguishes [the first Arthur Guinness’s] story is that he understood his success as forming a kind of mandate, a kind of calling to a purpose of God beyond just himself and his family to the broader good he could do in the world. [The Guinnesses] knew how to brew beer, yes, but they also knew how to care for their employees, how to invest wealth for social good, and how to create corporate cultures that would change the course of nations. In an era where there is immense distrust and cynicism towards corporations and wealth – to the extent where a significant portion of the population considers them inherently evil – I found this account of success and generosity inspiring. I highly recommend The Search for God and Guinness, especially if you lead or own a business. As the CEO of a small business and a person of faith, I came away from God and Guinness with a renewed passion to do 4 things. Do what we do exceptionally well. Create a culture of excellence, innovation, faith and generosity. Be more generous with our employees. Be more generous with in our community and the world. Do you believe wealth is inherently evil? Or do you believe in “the good that righteous wealth can do?” Do you believe companies have a responsibility to invest in their employees and make their communities better? If so, how? Post a meaningful comment to this post that contributes to the conversation (include your Facebook or Twitter usename in your comment so I can connect your comment to your share/tweet). One person will be randomly selected the morning of Wednesday 3/10 to receive a free copy of God and Guinness.